VRA! cover Dream Theater. A dramatic use of the internet? That didn't take long. Dream Theater's On The Backs Of Angels, the first single from the band's upcoming A Dramatic Turn Of Events, was released just two weeks ago, and already it's receiving tributes on the internet. The most notable - and by far the most accomplished - comes via the Brazilian outfit called VRA! A brainchild of Thiago and Felipe Campos from the band Bad Salad, the two operate a video collective that also goes by the name Split-Screen Covers. With Split-Screen Covers, VRA! - that is to say Thiago and Felipe - collaborate with other musicians online to create dramatic and innovative cover tune clips. 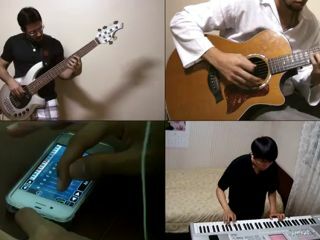 Their version of On The Backs Of Angels features the keyboard talents of Junghwan Kim from South Korea (check out that MorphWiz!) and the drumming of Paco Barillà from Italy. Bad Salad's Denis Oliveria handles lead vocals. The video has just been posted and the raves are pouring in. Significantly, Dream Theater keyboard master Jordan Rudess had this to say: "Guys - This is awesome. It sounds great! _ GOOD JOB!!!!!"